Niger’s parliament has voted to send troops to Nigeria to join the fight against militant Islamist group Boko Haram. The vote took place after Boko Haram attacked a prison and detonated a car bomb on Monday in the town of Diffa, near Niger’s border with Nigeria. MPs said parliament unanimously authorised deploying 750 soldiers to a regional force battling Boko Haram. The Nigerian conflict has increasingly drawn in regional states. 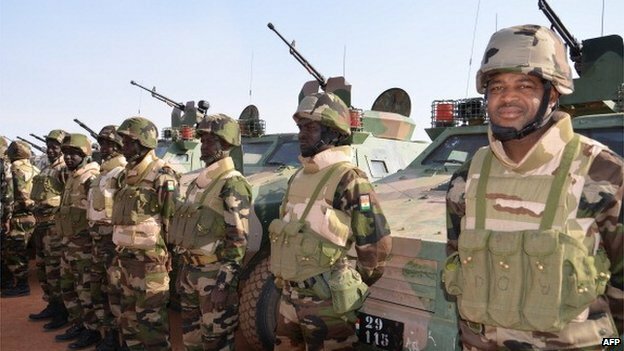 On Saturday, Nigeria, Cameroon, Chad, Niger and Benin agreed to establish a 7,800-strong force to fight the group. Boko Haram launched its first attacks in Niger last week, and has vowed to create an Islamic state. “The pooling of the efforts and resources of concerned countries will contribute without doubt to crushing this group which shows scorn, through its barbaric acts, for the Muslim religion,” Niger’s parliamentary speaker Adamou Salifou said after the vote, Reuters news agency reports. A journalist in Diffa told AFP news agency that at least one person was killed and 15 wounded in Monday’s bomb blast at a market. Suspected Boko Haram militants also hijacked a bus in northern Cameroon, abducting at least 20 people, residents said. The bus was seized near the border area of Koza and driven towards the Nigerian crossing, some 18km (11 miles) away, a resident told the Associated Press news agency. The conflict has forced a postponement of Nigeria’s presidential and parliamentary elections from 14 February to 28 March. At least 3.2 million people have been displaced by the insurgency, launched in north-eastern Nigeria in 2009, Nigerian officials. Posted on 10th February 2015 by newsafrica. This entry was posted in #BringBackOurGirls, Africa, Boko Haram, Niger. Bookmark the permalink.